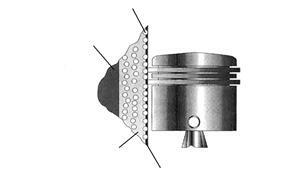 A plated cylinder in a single-unit with crankcase made possible by rapid plating technology. Adopted on the first YZF-R1 and other models. A plated cylinder is one that eliminates the conventional steel cylinder sleeve and replaces it with a coating of a ceramic base composite plating material in order to improve cooling characteristics and reliability. 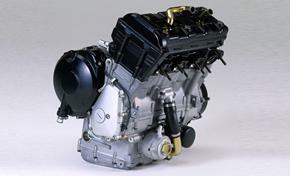 Although there are existing techniques for plating the cylinder surface separately, the Yamaha “Rapid Plating Technology” used on these engines makes it possible to plate only the necessary portion (cylinder sleeve surface area) on a single-unit crankcase and cylinder block. This is a technology that has been fed back from Yamaha’s manufacturing technology used on automobile engines built for Ford. 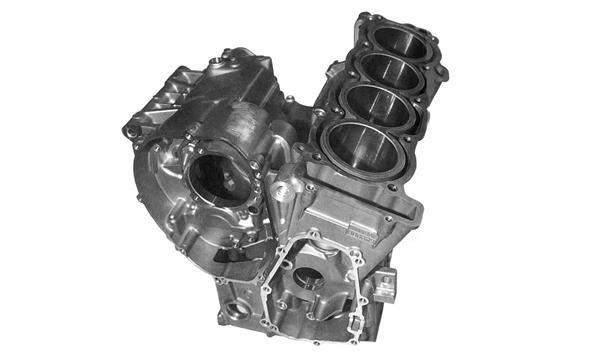 The engine developed for the first YZF-R1 model achieved a 10kg weight reduction and 81mm longitudinal length reduction compared to the existing engine, and one of the features that made this high-performance engine design possible was this single-unit crankcase-cylinder block. The formation of a thin film of oil between the piston rings and the Ni (P) metal imbedded with hard silicon carbide particles produces outstanding sliding efficiency. And, since aluminum with the same heat expansion rate can be used for the opposing faces of the piston and cylinder, there is minimum heat-induced change in the gap between the piston and cylinder as well as better cooling characteristics, thus resulting in more stable performance. As a result it also produces excellent oil economy.